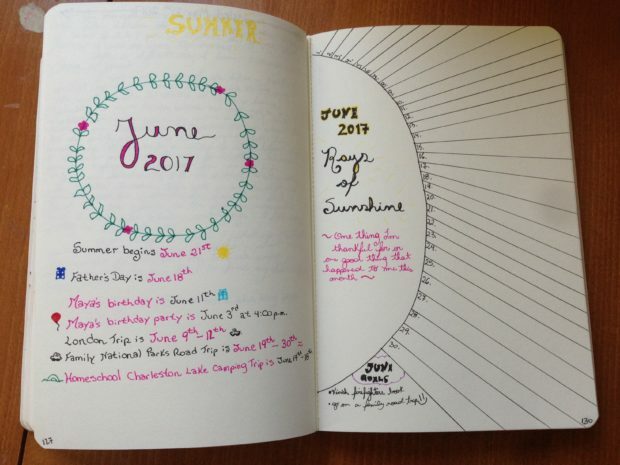 I came to the bullet journal’s creator’s website. It looked simple enough at first glance: even the cover photo on the home page shows a simple notebook with a list of things to do and events to attend. I was somewhat confused – after all, isn’t this what people like me do all the time? Write a list? So I started researching some more. From what I could gather by reading the bullet journal website, the premise is to simplify life. In a world full of apps and electronic everything, sometimes it’s nice to get back to basics and simply put pen to paper. Sounds simple enough – and appealing too, in my mind, since I *thought* I was already doing a “bullet journal” with my to-do lists. I use apps also, but I prefer pen and paper for my endless lists of things I have to get done. It all sounds simple and meant to save time, but then I started finding all these examples of “bullet journals” online, and I got really confused. I mean, the first sentence in the “geting started” section of the Bullet Journal’s website explains that long entries become a chore, and you’ll end up abandoning your journal. So make entries as short and straightforward as possible. But all these “bullet journals” on Pinterest had elaborate pages that look like beautiful works of art – don’t get me wrong; they truly are beautiful, but I hardly see drawing detailed icons and creating a beautiful art piece out of a to-do list as a very effective and quick way to do things – which seemed to be the point of the bullet journal in the first place. Are these people just taking the idea of putting pen to paper and creating their own thing out of it? And if so, why are they calling it a bullet journal? Most of these journals don’t even have any bullets! The bullet journal is meant to help you increase your productivity (how we obsess with this word these days… blog post about that coming soon!) and simplify your life. How does writing a list that becomes a work of art, thus using up valuable time, mean simplifying things? I do get how it could help with mindfulness — which is also one of the premises of the bullet journal. Well, confusion aside, I realized, in my “bullet journal research,” if we can call it that (I still haven’t arrived at any firm conclusions about the nature of this thing), that I needed to start putting pen to paper more often. I wanted to do more journaling and more doodling with my oldest daughter. So my Day Book was born. I refuse to call it a bullet journal because, like pretty much everyone else who’s doing a “bullet journal,” I’m not actually following any of the original premises that Ryderr Carroll set forth. I mean, maybe I should give the dude a little credit; after all, if I hadn’t heard about the bullet journal, I wouldn’t have started my Day Book in the first place. But anyway. I figured I’d give my two cents about keeping a Day Book (or a bullet journal, if you really want to call it that). I started keeping my Day Book in the beginning of April. I followed some of the premises of the original bullet journal, such as numbering pages and creating an index, just so I could find things later on. I then got creative and yes, copied a lot of the Pinterest stuff I saw (sometimes with a little success, and sometimes with hilarious results). Here is how I’ve been keeping my day book and why I do a lot of things differently than the bullet journal crowd. Firstly, I don’t use fancy pens. I do love fancy pens, but I have other budgeting priorities. Thus, I purchased fine-tip markers at the local dollar store. The markers cost $3.50 and do the job just fine, so long as my kiddos don’t get a hold of them. Like every other fine tip marker, if you put too much pressure on them when you’re writing, the tip gets damaged. Secondly, I know the preferred notebook for most people who jumped on to this bandwagon is the one with the little dots . Well, I say, heck with the little dots. They curb my creativity. I went to a bookstore and bought myself a sketchbook with off-white, blank pages. This type of notebook helps me to not feel restricted in what I use the notebook for. In here, I can doodle, make plans, make art, and be unrestricted by lines or dots. Also, being unrestricted shows my quirks and imperfections, and I think it’ll be fun to look back at how at 35, I still can’t write in a straight line. The cover was very plain, and it’s hard to know the front from the back and the top from the bottom, so I put cute little stickers on the front. Because stickers are awesome. My cover, which I admittedly just created a couple of days ago (after using the notebook for two months), was lovely to make – and took forever. But that’s the point – the reason I refuse to call it a bullet journal. This thing isn’t meant to make me more “productive” or get more things done or to save me time. It’s meant to give me an outlet for my art, my thoughts, and help me to sit down once in a while, free of guilt, to do something I enjoy – writing and drawing. I experimented with keeping track of different things. I loved the idea of the “year in pixels,” not only because it looks neat, but because when you’ve struggled with mental health issues in the past, it’s useful to track whether you’ve been angry/sad for a long time, etc. The problem is, as you can see, that it’s very difficult to remember to actually track it on a daily basis. Not sure if I’ll do this again next year. Also, with how much I use this book, the year will be over before I finish tracking, and then I’ll have to deal with two books, and it’ll just be a pain in the behind. I experimented with setting goals for the month (like I tell everyone to do, and then, like the hypocrate I am, don’t do myself – but I’m working on it – see? I set goals for April). Of course I didn’t achieve all those goals, but oddly enough, I don’t feel guilty about it anymore. I can look at this book and see everything else I did accomplish, and for the first time in a long time, I’m able to concentrate on the things I did right. I then wrote a note about what I need to work on the next month – judgement free – just a note about working on those things. See, this thing is helping me already. I experimented with tracking everything health-related, from my food and water intake to whether I took my medications, to whether I exercised. Well, that’s a lot of stuff to track, and I quickly ran out of time/stopped recording, which left me with pages upon pages of things I was hoping to track but ended up staying blank. K-girl to the rescue: she loves to doodle, and so we spend time each afternoon looking up step-by-step drawings on Pinterest. And thus my blank pages are filled. Through this experience, I have learned that I prefer to keep track of my medications and recurring chores through an app rather than on paper. I have too many chores to write and rewrite them day after day. I use an app called Home Routines for this, and I love it. It was very inexpensive, just a one-time fee, and the reason I love it the most is that you don’t need an Internet connection to use it. I love being able to check off my chores without having to worry about connectivity. Having said all that, I started using my Day Book for other things I enjoy and that have a good impact on my mental health — namely, journalling. I love all the neat lettering things you can do, and I like to draw, so I started making fancy titles for my journals and for dividing things up in my Day Book. Years from now, when I’m looking at this book, I’ll have a smile on my face, remembering that on May 28th, 2017, my son started riding a bike without training wheels. Sure, I could just take a picture and organize it by date on my computer, but I’m one of those crazy people who still likes to print out photos and sit on the floor, surrounded by photo albums, reminiscing about great memories. I think I was made for a slower time. Another thing that is helping with my mental health is keeping a gratitude journal in a creative way (admittedly, I copied this idea from someone else). I’ve tried keeping a daily gratitude journal in the past, and I always find something better to do, and abandon it after a few days. Doing it with this lovely sunshine image does two things. Number one, it reminds me to jot down a grateful thought every day, because I love sunshine and that image always catches my eye whenever I open my Day Book. Number two, this is a piece of artwork that is only finished once something is written down for each day, so I always write something down. I also use my Day Book to create art out of mundane things, like the to-do lists that I was already writing anyway. For my annual weekend off, making this fun to-do list actually helped me to get into the vacation mood I wanted to be in: completely relaxed and guilt-free. I could have made a simple list, but that’s not the point. The point is to do things you don’t have to do, but that you want to do, just because you want to do them. We could all use a little more of that in our lives. So yes, to some people, doing what I’m doing may seem like a waste of time. But I’m a firm believer in the concept of “time well wasted” (thank you Comedy Network for that genius slogan). So, let people think I’m wasting time. Wasting time isn’t always a bad thing. As a matter of fact, I think all of us should be wasting a little more time. You know, there was a time I felt exactly like this person about “bullet journals,” except the things she’s mentioning aren’t really bullet journals at all, at least not in the way Carroll initially described them. Like this person, I also looked at the (sort of) “bullet journals” and thought, who in the world has time for this stuff? But truth be told, we all need to make a little more time. I enjoy sitting at the table with my daughter and drawing with her. But now that I’m trying to learn to draw, I find that I like to be alone to draw well. These pretty pages in my Day Book come with no strings attached; they’re just my daily journal, my place to set my creativity loose without fear of having to start all over (which I do feel I have to when I’m drawing in my “good” sketchbook and the drawing doesn’t come out so good). The truth is, we could all use a little more “wasting” of time. We’re all too busy to just stop and do something just for the sake of doing it. Just because it’s something fun and enjoyable to do. We’re all too worried about “productivity.” I’m starting to really dislike that word. The truth is, we all could use some “la dolce far niente,” whether that’s done by sitting in the sun (with or without a good book), or by doodling in a Day Book (or a bullet journal, if you really want to call it that). A little relaxation and a few minutes of worrying about nothing could do us all some good. Do you keep a Day Book? Not a day book per se, but a “whenever I have time to draw and reflect on biblical readings or any other reading” journal. I do have a new journal now that is arriving this week that I’m very exited to start using. It’s a liturgical day planner with some space for drawing too. In it, I’m planning to keep my daily to do list, follow the liturgical year readings, reflect on those, and draw about firsts, our findings from our nature walks.